I recently got back a critique from a Beta reader. When I send out a piece of writing to either an editor or a Beta reader I make sure that I’ve given it my best. I like what I’ve written and am looking forward to praise. Hurray! Ready to send out. Not so. The piece of writing which I had sent out happened to be the opening ten pages. The stakes here are high, as you all know. Readers stop reading a novel for many reasons and when they do it varies from the first sentence to the first fifty pages or so, although I know readers who will read to the end of the book even though they are no longer interested in it. And sometimes the gems of a novel are found more towards the middle and end. But most readers judge first on the book cover and then on your opening. Let me mention that this Beta reader is also a published romance writer and that we’ve been writing buddies for a good six or seven years. I have a great deal of respect for her advice. Still, after first reading through her comments I felt resistance on my part. She doesn’t get my writing. She’s a romance writer and this is a crime novel. That phase passed and I went through her comments reflecting on each of the flaws she’d pointed out. She suggested that I begin my story with the protagonist rather than the antagonist as i had done. I know that a lot of books on writing recommend starting with the antagonist. But does it always have to be the case? I like my chapter where I introduce my antagonist. I find it strong and maybe that’s why I chose it as the novel’s opening. The chapter which introduces the reader to my protagonist lacked that zap opening. Why was that? I wondered. It’s a scene between a mother and a daughter. Although I knew the daughter’s character well, I still needed to go deeper into the mother’s personality. Knowing that she’s a junkie/alcoholic who was raised in a Youth Protection Center since the age of four wasn’t enough. I recently received the latest two thesauruses (or is it thesauri?) written by the Ackerman &Puglisi gals. I already have the first one on emotions which is in the process of being dog-eared. I keep it close to my desk, cherishing it like an old sweater. I went through the table of contents for both the attribute and the flaws books, going down each item, deciding whether the mother possessed that characteristic. For the sake of efficiency, since I was going through the lists I might as well go through them for other characters. I made a chart for six characters who play some role in the novel. Sometimes the characteristic either just fit like a glove and at other times I came across some that I thought would be neat to include. For example, the attribute quirky. I’ve always liked quirky characters although I didn’t know how to write quirky but the gals’ books provided me with a list of behaviors, emotions, thoughts, conflict traits, ideas for scenarios and more. I decided to give quirky to the detective, Alice Vireo. I also wanted to make certain that my scene contained these five elements: action, thoughts, description, emotions, behavior. All of this took me about two hours but I now had traits for my characters that I can refer to as they appear in the novel as well as a clearer comprehension of these characters. Whether this scene between mother and daughter was to become my opening scene or whether I would still keep the antagonist as my opening I could decide later. In any case, the scene needed to be re-written and even parts, as suggested by my Beta reader, to be created. This took up a great deal of my time and I am still unsatisfied with it. 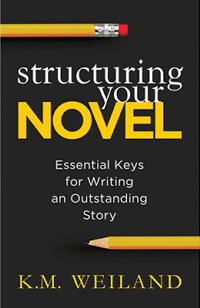 While reading K.M.Weiland’s book Structuring Your Novel I serendipitously came across her chapters on opening pages and hooks. In reading her chapter I realized that I was not setting the tone of the story and that the conflict between the mother and daughter was not strong enough. It has been two days that I’ve been thinking, reading about, making character charts and writing and re-writing the scene between Annie and her mother. I’m still not done. Nor have I yet decided whether to begin with the protagonist or antagonist. What are your thoughts? Do you think the protagonist always should begin a novel?